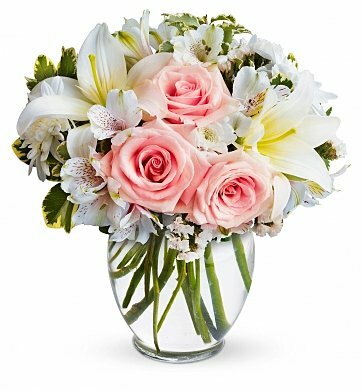 Snowy white blossoms are poised with ballet-slipper pink roses in a sparkling clear glass vase, creating a lush, fragrant bouquet that's perfect for any occasion. White Statice, Lush Greenery and more. Tender Heart Bouquet is a hand delivered gift. These gifts are delivered by one of our local design centers located throughout the United States and Canada. Same day delivery is available for most gifts when ordered before the cutoff time. The cutoff time for Tender Heart Bouquet is 2 PM in the recipient's time zone. The flowers were beautiful and on time. I ordered flowers from this company last year for my Mom's Birthday. I was pleasantly surprised to get a call and e-mail reminding me to get her flowers ordered for this year. Like last year they arrived on schedule and My Mom said they are beautiful. On time delivery and friendly customer service. Was told by the Person I sent the bouquet to just raved about it. It was delivered as promised right on time. Very pleased with the flowers! I sent the "better" version to my mother on her birthday. It was beautiful and she loved it. Even prettier than the picture. Recipient reported flowers were beautiful & arrived exactly on time! Great presentation and it got there when it was supposed to! Your service was perfect, and Mom was So Pleased. Thank you! Arrangement was just as beautiful as it appeared in ad. Was a beautiful bouquet ! it was very good ! I was more than satisfied with the flowers that were sent to my mother. I ordered the night before they were to be delivered and there was NO PROBLEM!!!!!! I will definitely order from this company again. The flowers arrived in perfect condition. The receiving person was very pleased. I will definitely order again. Arrangement was better than expected and the service was outstanding. Sunday delivery and it arrived early in the day! I was very impressed! I ordered a same day rather last minute, about 1:30 pm and the flowers were there by 4:30 pm! My Aunt says they are gorgeous! Thank you! I was dealing with a funeral far from me. Customer service rep Matt came on the line and was so calm and concerned it calmed me. He found flowers in my budget pulled them up for me to view offered a discount and placed the order. He took away the stress. I sent this bouquet for a funeral. The family couldn't say enough about how lovely the flowers were and how nice the fragrance was. Thank you! Service and communication was excellent...delivered the flowers in advance to the funeral home. Thank You. I gave the wrong address but they quickly tracked me down and we corrected and the flowers were still delivered on time. Very nice staff and recipient of flowers was very happy. THanks! I purchased this arrangement for my girlfriend upon the passing of her great grandmother. It made her awful day a little bit less awful and really helped to demonstrate my sympathy and love for her. She was very appreciative as am I. Thank you so much. I got these to congratulate a friend on her new job. She loved them and they smelled amazing. Delivery was successful as well. Just what I needed to express my condolences. My first day of work at a new job, I just happened to run into my sweet-heart from high school, Missy. I didn't expect to see her anytime soon after that. The very next day, I was minding my own business on lunch break when she came straight to my table to visit. I was stunned. We chatted about my new job and how great a company it was. Now after my girl friend and I broke up in high school, I befriended her younger brother. We became close friends. Even recently her brother and I visited. Then I directed the conversation to her life. Missy said, "You haven't heard? My parents couldn't call you. My brother died two weeks ago." I was stunned again. I had missed his viewing, the funeral, everything. What could I do to express my deep condolences to this grief stricken family? I'm so grateful that One Stop was there just when I needed a quick heart-felt expression of my sorrow for my friends' tragic loss. They offered a beautiful flower setting at a great price including shipping! Great job! They where better than expected. Definitely had its desired effect. I ordered the flowers on the morning of our anniversary. The flowers were delivered that day at my wife's work and were beautiful. This is the second time I have order this exact bouquet for a funeral and it was just as stunning as the first time. Absolutely beautiful! According to my brother, Ret. Col. Michael P. Mcginley, the flowers were beautiful. My sister-in-law was very pleased. The chosen flowers were lovely and the arrangement was perfect. They also liked the young lady who delivered the flowers! All in all, the quality of this experience was excellent! Amazing! My girlfriend received her flowers that day! Also came to visit me for three days and when she came back the 4 Lilly bulbs had bloomed! The gift that kept on giving! I've been sending my mom flowers every year between her birthday & Mother's Day for the last 25 years. This was the 1st time I ordered from this site. She was extremely excited and pleased with the bouquet. She said it was one of the MOST beautiful bouquets I have ever sent her! She also loved the fluted vase! After 25 years of flower arrangements, she has a lot to compare to. Thank you! In addition, your webpage is awesome and the ordering process very simple. The ability to deliver the same day/next day with no additional monster fees is great too. I will ABSOLUTELY use you for my future flower purchases. The recipient of the flowers said they were very beautiful. The bouquet was like the picture and the friend I sent it to just loved it. I will use your service again. I was pleased with every aspect of my purchase and the delivery. Thank you for the service. We sent several of these from our business to our supporters as a Valentine "thank you". We heard back that the arrangement was lovely. Thank you so much! I sent these to my mother, recovering from major surgery. She called with raves about the most beautiful, fragrant flowers! Very good service with exceptional up-dates provided. Flowers were delivered in good time. I was very pleased with the service. Thank you. Very beautiful and a reasonable price. I was told by the recipient that it was a beautiful arrangement. They were very pleased. It was a beautiful bouquet just as ordered. It is worrisome ordering flowers for someone in another state. I ordered these for my mother. They were beautiful and lasted well beyond what was expected. Thank you and I will be ordering from this company again.....in fact I already have. Beautiful. Excellent. Perfect. Lovely. Timely. My friend called and was flooded with thanks for the beauty of them all. Good job! Great flowers, fast delivery. We are all happy with your service. Beautifully presented and efficiently delivered to lift the spirits of my daughter after a car crash. Everything went well and as planned. This florist went above and beyond my expectations. I had flowers delivered to my s.o. at a hotel and they arrived in beautiful condition. Highly recommend. The friend I sent them to was thrilled and it made her day. The flowers turned out exactly how I wanted them to. Thanks! I ordered this for a friend's birthday. She was very happy and it came the same day! Flowers arrived the same day I ordered and my stepmother says they were gorgeous and are still beautiful almost two weeks later! Excellent arrangment and very lovely asortment of beautiful flowers. They lasted more than two weeks. Thanks you so much for making these flowers to be a special present! My daughter loved the arrangement! The arrangement was as seen on the web and with timely delivery. The flowers were delivered and they were beautiful. The family was really happy, thank you. Beautiful arrangement and the flowers lasted over a week! Great Job delivering the flowers! Although I didn't see the bouquets I sent for Mother's Day, both my mother and my mother-in-law called to say how beautiful the flowers were. I loved how easy the process was and I am thrilled that the flowers arrived on time as promised. We live in Charlotte, NC and we had these flowers delivered in Rochester within a few hours of ordering them. Great pricing, great delivery and wonderful presentation. Thank you so much. I sent this arrangement to a dear friend you recently lost a loved one. She said these were absolutely gorgeous!! She totally loved them and they brightened her day! An appropriate arrangement for any occasion; one I often reorder. Just as presented - really lovely. AND - as usual - Gift Tree outdoes itself with fantastic customer service perfectly on time. Thanks Gift Tree - I am a customer for life! I order these for my sister. she was in ICU, which i didin't know at the time. Gifttree took them back cause you can't have flowers in ICU. They told me when she gets a room call and they will re-deliver the flowers, and they did.